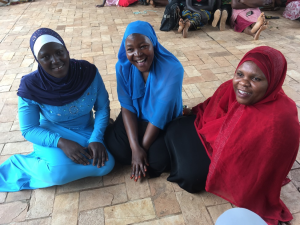 Struck by how Aisha, Hanifa and Sara (three Muslim ladies of Meeting Point International) would gratuitously avail time to monthly sell Traces, we decided to go deeper to discover the reasons why they are so moved. Here is an abstract of what transpired in the dialogue with them. – Why do you sell Traces? Why do you like it? I’m a true Muslim, an original one. I joined Meeting Point International in 2011. I didn’t know what Traces was, but I started buying it, reading it and loving it. There are a lot of beautiful things in this magazine, which you can learn from. In particular, there are other people experiences, and when you read an experience that is different from yours, you discover more about yourself, about what you really desire for your life. As a consequence, I’m now studying catechism, I’m going for community school, because I want to learn more about it. Even if I’m a Muslim, I joined Meeting Point International. This is because there were other people around me, but in my life nobody has welcomed me like at MPI. I was so surprised by the way they welcomed me and treated me. I used to have a lot of sorrows, my heart was heavy; but from the day I reached this place my life has changed. I’m now happy, and my family too. So, about Traces: actually I don’t know English very well, and I even can’t read this magazine, but because of the friendship I got here, I sell it, and I love doing it. This friendship pushed me to sell Traces, but also to love this religion. Sometimes I think I believe in this religion even if I’m walking on the Islam path. I remain Muslim, but I love Catholicism. I joined MPI because I wanted to be happy like these women. One day there was a woman next to me with an issue of Traces, and looking to the pages of the magazine I could read a word: happiness. But that woman was going away, and I didn’t know how to find that magazine again, so I asked her to take a look. And I saw a lot of pictures, and in all these pictures people were happy. So I asked her the cost, and I bought my first Traces for 3.000 ugx (approximately 1 usd). Reading it, I was surprised because everything in that magazines was about happiness, the possibility to be happy even if you are in trouble. So when you read about these experiences of happy people, you also become happy. Not even one story in this magazine could make you not happy. Even now it’s like this: every time I buy it – and I always buy it – it makes me happy. Traces made me also understand that religions are different, but often what separates us is just the way we dress; instead we are together, because God is one. This is what I’ve learned from Traces. – Could you explain your love for this Catholic experience, for Traces despite the fact you are woman of Muslim faith? How can these two go together? Rose told me about my value, which I didn’t know about before. So I understood that this Catholic religion does not segregate, it welcomes all religions. That is because of what Rose thought me: you have to discover yourself. It means that nobody should tell you: “Come here and be a Catholic!” You are the one to learn it by yourself, but after you have discovered yourself. When you know who you are, you decide what to be. And for me, after discovering myself, I decided to stay with these Catholics. When I was suffering so much, no one was touched by my situation, nobody helped me. But here I discovered I was helped… Someone has loved me, someone gave me her friendship. I even don’t know how to explain it: one day I was crying all day long, and my children as well, they were going to a very bad school, they even didn’t receive their reports… Now I’m happy, my home has changed completely, my children go to school, they study in peace, they are happy. So how could I not love this place, which brought to me all this happiness? How could I not love this magazine, which tells stories about this place? Usually I buy all the remaining copies (because I don’t want to waste them) to give them to my friends and family members. At first my father, who is a Muslim, asked me where I got it from; but now he likes it, I told him to ask me if there is anything he doesn’t understand. Often Traces is so beautiful that I buy more than one copy, because I know that the one who will receive it, surely will also be happy. – When you are selling Traces, what do you tell the people you meet? First I read it very well, and I pay attention to those beautiful things which make me happy, which help me. And because I want other people to be happy like me. And people understand if you are selling something important for you. What I read in Traces is what I tell to the people I meet, I even show them the page where the point I like is. And people ask us a lot of questions. I can’t read Traces because I don’t know English, but my children read it for me at home. They show me on which page the article I like is, and so when I’m selling I can tell people: “Look, it’s right here!”. Before you sell it, you first go through, so you know the meaning of what you are saying when you are out of the church shouting “Traces, Traces!” And you have to explain, otherwise it’s just a name for the people, they don’t understand. But if you tell them your own experience, they will tell you: “Ok, I trust you, I’ll buy it”. – What was your most beautiful experience while selling Traces? 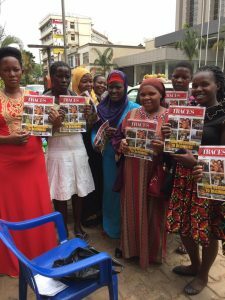 The most beautiful thing for me is that when we are selling it; a lot of people come to us because we are Muslim, asking why we sell a Catholic magazine. And we can answer them: “Because we love it; because we are getting beautiful things from it, and we want also you to get them”. One day I was selling Traces, and an old educated Catholic man came to me, asking me a lot of questions to embarrass me. He said: “You people, what are you doing? Is this thing from Uganda? Where is it from? Is the Pope aware about it?”. But I could answer very well to all his questions, I told him about Communion and Liberation, about Italy, and I told him that even the priest, during the mass, had given the announcement about this selling. At the end he said: “You Muslim woman, you have challenged me”, and he started looking for money in his pocket to buy one. When I’m selling it, I’m feeling as if I’m selling gold, a very expensive thing!